Jack Lugar credits that phrase as inspiration for his 1940s-style children’s book series, “Katz Pajamas.” The series follows Katz Pajamas, an extraordinary detective who solves mysteries in the fictional city of New Purrt, Calif. Lugar’s first novel was published in May 2017, and the third, “Katz Pajamas: The Catastic Carnival Caper,” was published this year. Lugar, a Fishers resident, started writing novels while working as a screenwriter in Los Angeles. He and his wife, Elisabeth, moved to Los Angeles after graduating from Regent University in 1994. They dreamed of becoming sitcom writers. “As a kid, I was not a reader. I was a slower reader, so I think that made me not sure that I could do it, but I grew up in the theater doing a lot of acting and performing so I always had that bit to the arts,” Lugar said. Lugar used connections he established while he was an undergraduate student at Taylor University to land a job as a production assistant in Los Angeles. He eventually became a sitcom writer for “Wanda at Large” on Fox. “Timing wasn’t the best because around that time, reality shows were taking over and sitcoms were dying,” he said. In 2005, Lugar and his wife moved back to Indiana with their two young children. After a brief time in real estate, Lugar began adjunct teaching at Anderson University in 2012. He is now a full-time associate professor of cinema and media arts. 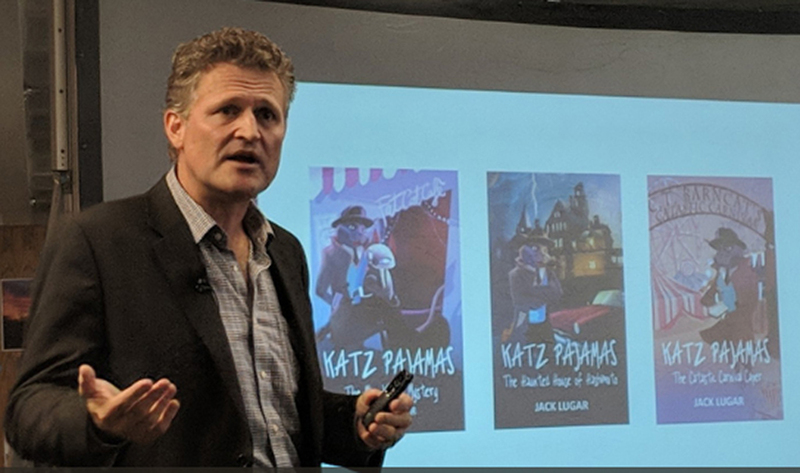 Lugar had already published two books independently through the Indianapolis Business Journal’s publishing arm and Amazon before beginning Katz Pajamas. Katz prints on demand when an Amazon order is placed. If Lugar edits the script, all he has to do is upload the new manuscript. “There’s that neat opportunity to share that there’s a different way to write and publish than what we’ve been used to,” he said. Lugar plans to continue the series and he wants to start a young adult novel.